I have a confession. I may have a serious addiction to reusable bottles. Over the past several years I have managed to collect quite a few water bottles. I have a cabinet in my kitchen stuffed with probably a dozen various bottles; mostly stainless steel. There are some huge ones, some medium ones and some kids sized ones. Well now my addictions is growing. I have expanded from water bottles to include travel coffee mugs as well. About a month ago I received a Klout Perk to The Clymb, a daily deal site for outdoor gear. I had a $50 credit to spend and instead of maybe a backpack or some clothes I chose to spend it all on a deal for Aladdin bottles and mugs. Wait, I should change that to we because my husband was really excited about picking out a new travel coffee mug. Yup, that is seven new pieces to add to our collection. In my defense, two of those (far right) were gifts for my mom and step-dad. But the remaining five are all ours. The three purple on the left are for me: an insulated plastic cup for my iced coffee and Frappucinos, a tall water bottle with a cap that doubles as a cup (how cool!!) and a hot coffee mug. The fact that they have purple accents makes me smile. But now my bottle/mug collection has spread to a second cabinet. I think I need an intervention. Is there anything that you keep buying a lot of even though you probably don't need them? we have a big collection too but we're always losing them or breaking them so it usually cycles through fairly well. They make my husband crazy but at $1 and up for each time we take one bottle out instead of stopping for a drink somewhere, I don't know how you can't love these things. My cupboards are full of water bottles and coffee travel cups. Our only problem is that my husband fills his coffee mug, and invariably heads out to the car leaving it on the counter. I think my neighbors are laughing at me. They see me running after him, with coffee mug in hand,all the time. I had to stop myself from buying more reusable bags! I have so many and I still find myself at the store without them! Lol, look at that collection! At least they aren't plastic though. 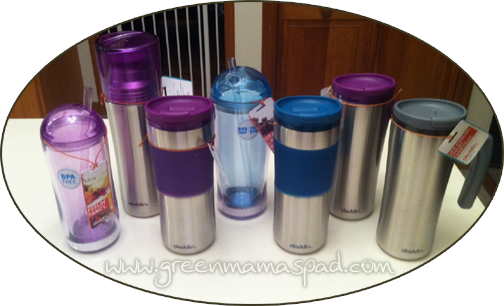 You can never have too many stainless steels water bottles! I love them! Um, yeah. I think I'm addicted to buying jeans. It seems that I can never have enough. I need to clean out my closet.